What if you get bitten, and don't know what has happened to you. You don't know that you are turning into a werewolf. Well that is the story of Scott. And if that wasn't bad enough, try being hunted down by your girlfriends father and his pack of hunters.. I came across this series, I think through Goodreads, where someone was talking about tv-series they were watching. Honestly, I wasn't sure if I was going to like this show, yet another teenage drama show. 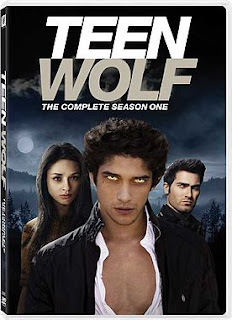 I ended up actually liking it after all, all though I am not a big fan of Scott. Scott is just a bit like a spoiled little brad whining about everything in his live. He doesn't like being a werewolf, while a lot of people would have die to become one, he hates it. Stiles makes up for a lot of things Scott lacks, he is funny, sweet and smart. Oh and then there is Derek he is the only delicious character on screen (hey, I am aloud to watch hot men I am single, so excuse me).Derek is one of those tortured souls that warm my heart. The plot is decent, a bit predictable sometimes but not bad, the season warms up to a pretty spectacular finale. All in al not bad over all. Ok characters, decent plot, wolfs that do not turn into wolf form but more into the wolfmen like they were in the old movies. Big grand finale and a promise for a second season, leaves me to conclude that this a 3 skaters kind of tv-series.